Awesome Ocean Front Vacation Suite with Stunning Ocean Views great for Family's of 6 or less. Inn of the Sea Resort, Nanaimo Vancouver Island. Extras– Large patio with spectacular ocean views, Wood burning Fireplace. Large Oceanside Pool heated May long weekend to September 30th. For resort guests only, Oceanside pool and hot tub. Hot Tub is heated and open year round. The pool is heated May long weekend till September 30th. Comfortable and cozy queen sized master bedroom. Large patio door open up to a spacious patio with wonderful ocean views. Enjoy watching sailboats and cruisers go by. Go for a hike and discover a beautiful Waterfall. Dinning area seats up to 6 people. 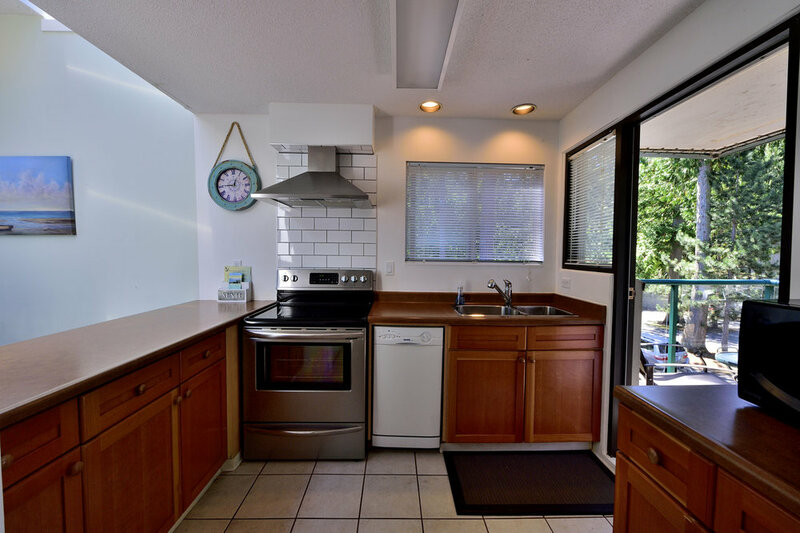 Fully equipped spacious kitchen have everything you might need. Enjoy tall cedar trees, birds and bunny's from our back patio. Private deep water dock, for boats up to 30 feet. Go for a kayak right from our beautiful beach. Beach consists of large flat sandstone and small gravel. Second Bedroom - Cozy queen sized bedroom with en-suite, located on the 2nd floor. Our condo is Located up the stairs on the 2nd and 3rd floors. Unit numbers are displayed on the glass railing on the balconies. Coin operated Washers and dryers are available for guests. Enjoy dazzling sunsets from Neck Point Park, Nanaimo BC, Vancouver Island.